One day at Panera Bread in Jacksonville we (Jessica, Joanne [mom], and Courtney Gullett [Love for Ethiopia Executive Director] ) sat down for an hour meeting. Jessica discussed her interests in fashion, travel, and her interest in pursuing the Girl Scout Gold Award. The Gold Award is the highest award earned in Girl Scouts and requires the girl to an 80 hour sustainable community service project. Mrs. Courtney discussed her nonprofit and the Sitota Learning Center. 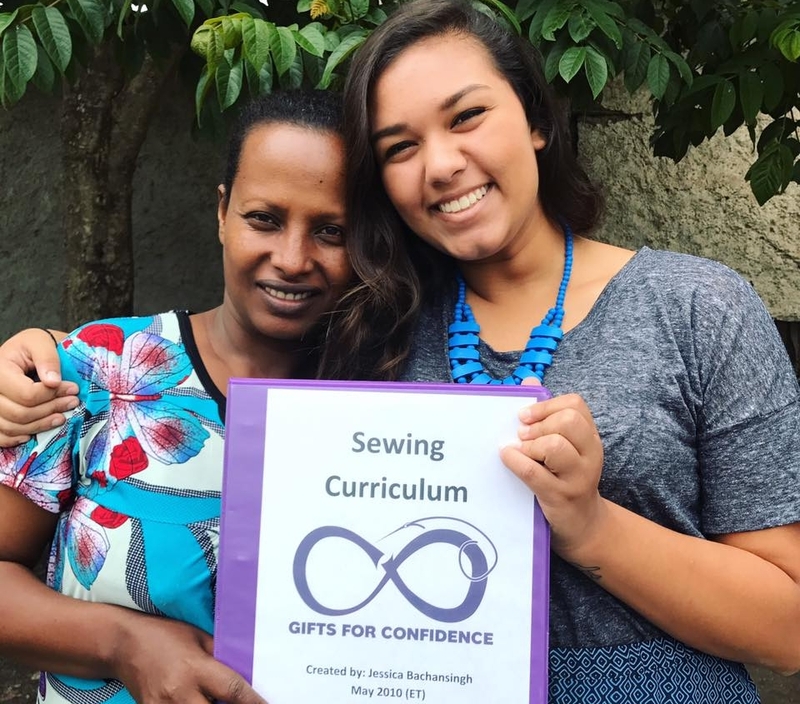 The idea to start a sewing program at the Sitota Learning Center in Awassa, Ethiopia was born. Jessica planned to fundraise the money to purchase the materials to start the program, and then the girls would learn how to make infinity scarves. Many strategy sessions at Panera followed this initial meeting. Jessica partnered with Whole Foods in Jacksonville to host a clothing donation drop-off. The clothes were sorted based on gender and style. The sale took place in the gym at St. Joseph’s School in Jacksonville. Over $600 was raised from this sale. Watch this fundraising video that was put together in the early stages. The Clothes were sold again! This time at our house in Jacksonville. We raised a couple hundred dollars. The clothes were sold in the parking lot of the Ethiopian church in Jacksonville. We raised almost $700 from this sale. The remainder of the clothes were sold by the pound and recycled. Thank you to everyone who donated clothes along the way! This was our (Jessica and Joanne’s) first trip to Ethiopia. We made it after many donations, and fundraising. We set up the sewing classroom and began sewing with six girls. They were in 7th and 8th grade and spoke some English. After the first day of sewing each of the girls had made their very own scarf and they got to keep it! After 3 days of sewing they had created 75+ scarves, learned how to hand-sew, mended uniforms (an unexpected surprise! ), and taught their teachers (which ensured they could teach others the skill). Lots of lessons learned, but magic happened on that trip. See 2015 Gallery. Material was Purchased and sent over to Ethiopia with one of the Elpis Mission Teams. Thanks to Corrie Freeman for coordinating this Summer Sewing. The Elpis Mission Team came home with a suitcase full of scarves. The girls worked for 2 weeks to sew! 269 Scarves provided us with the first inventory! The inventory was officially for sale. The Etsy account for Gifts for Confidence was open for business the weekend before Jessica went off to college at Florida State University. Jessica receives a $4000 scholarship to do a non-profit internship under Elpis International and return to Ethiopia. She works for a month over summer to register this program as an official nonprofit. Under the summer scholarship, Jessica created the new curriculum for the sewing program. It is versatile and includes several sewing projects for a yearlong certificate program. While in Ethiopia, Jessica spent three weeks reviewing the 21 lessons in the new curriculum. The curriculum was also translated into Amharic for complete understanding of all the lessons as a teaching guide for Friwot. As a student at Florida State University, Jessica worked for several months as a competing entrepreneur in the Innolevation Challenge put on by the Jim Moran School of Entrepreneurship. After several rounds of pitching and judging, Jessica was a finalist receiving a $4,000 grant for the "Most Viable" business.